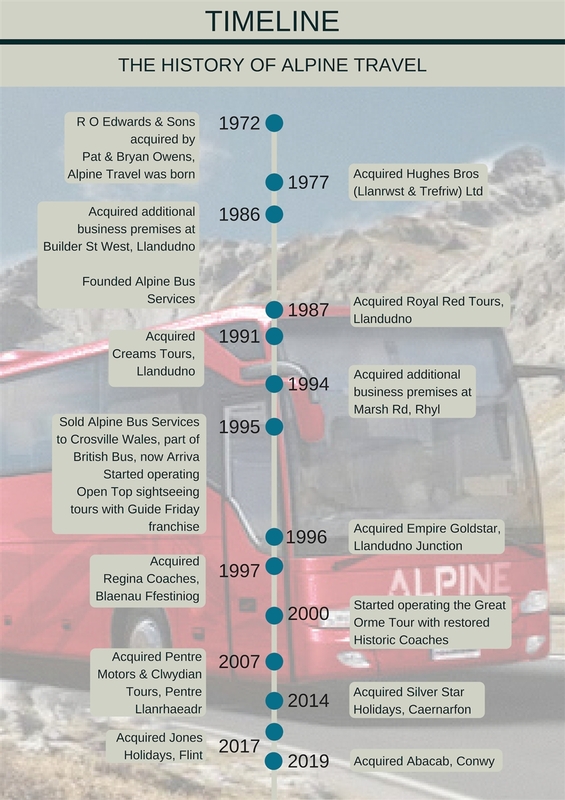 Founded in the little market town of Llanrwst back in 1972, Alpine Travel has now grown to be the largest independently owned coach operator in North Wales. The company was founded by husband and wife team, Pat & Bryan Owens, when they acquired the business interests of R.O. Edwards & Sons, along with 6 aging coaches, that were engaged in local school and private charter operations. In the early years Pat & Bryan laid down the very solid foundations and business principles upon which the present day company is founded, which, despite its size, is still owned and managed as a local family business. Throughout these changes, the core business principle has been to provide the best possible service at an affordable price, whilst providing long term stable employment opportunities for local people. This ethos has served the business well, and whilst Pat & Bryan are now retired, the business is still managed by their son Chris. Today the workforce of approximately 100 people consists of drivers, engineers and admin staff, some of whom have been with the business for in excess of 40 years, to new engineering apprentices, trainee drivers and graduate management trainees who have been with the business a matter of months. Today Alpine Travel is the largest coach operator in North Wales and the only coach operator in all of Wales to have been successfully audited and be a member of the UKs two leading industry accreditation bodies CoachMarque and the Guild of British Coach Operators. The essential quality required by both of these organisations is an ongoing commitment to training and customer service, both of which go back to Pat & Bryans original beliefs. As testament to the company's ongoing commitment to its ongoing investment in vehicles and premises as well as in the training and development of its workforce. Alpine Travel is delighted that its Jones Holidays driver team have been shortlisted for the 2018 British Coach Tourism Awards.